In the early days of radio the radio was known as a wireless, because sound could be transmitted to the listener without the need for connecting wires. The amplification of the sound from radio waves was by means of valves. These looked rather like light bulbs but with complex structures inside them that glowed rather than lit up. They often had several pins under them by which to plug them into the wireless frame. All this has been replaced in the late twentieth century by the transistor, firstly as a discreet device, then later as the integrated silicon chip which may contain millions of transistors. The old wireless contained as few as one or several valves each of which provided the equivalent of one or a few transistors! Mr J. W. Pattison was the moving force in the company and they began by repairing valves. A repair could be carried out for only about three quarters the cost of buying a new valve so economy was on their side. Radions developed a cardboard package for the safe transport of valves through the post. It looks extremely simple and obvious today but back then it would have transformed their ability to provide an efficient repair service using the postal service for communicating with their customers while reducing the number of breakages to a minimum. See the US version of the patent. It is thought that Radions had closed by 1930/31. This came about because the price of new valves from the major makers was reduced leaving Radions new valves uncompetitive and their repairs uneconomic. The valve pictured is a repaired R5V triode, which was a development of the ‘R’-type valve. It is a bright-emitter valve; that is to say that the filament glows brightly like a light bulb. Later filaments were coated with a thorium oxide layer, which allows electrons to ‘boil off’ at a much lower temperature, so the filament could run at dull red heat. This gives superior performance with much longer filament life. The filament on a bright-emitter valve normally either melted or simply fractured due to the considerable thermal expansion and contraction. Wireless sets incorporated ‘filament rheostats’ to allow the current and hence temperature to be reduced to the point where adequate performance could be obtained – wise users kept the filament current as low as practical, but a multi-valve set still gave out enough light to read by! I expect that most of Radion’s repairs were filament replacements, followed by re-evacuating and sealing the glass envelope at the top of the bulb (see the spike on top in the picture). Valves in the 1920s were poor performers by modern standards; we used a technique known as ‘reaction’, which is a form of positive feedback, to make the receiving tuned circuits get very close to oscillation, thereby increasing the amplification. The ‘wooden box’ and ‘copper box’ receivers using this technique can be seen on another page . By this method, even a poor valve could make a relatively good receiver; far better than a crystal set, which has no amplification at all. If the ‘reaction control’ was over-adjusted, the valve would oscillate and behave as a transmitter, interfering with all the sets in the vicinity. It seems from my experience that Radion’s used a fair bit more red phosphorus as getter than most contemporary manufacturers. Their valves (the very few that I have seen) are considerably more densely coloured than many others that used phosphorus – most, if not all of them, in the 1920s. By the 1930s, most valve makers were using magnesium, which gives the more usual ‘mirror’ appearance to the glass. In 1918 Messrs Crowther and Osborn established a factory in Lowerhouse mill to manufacture household electric lamps under the name of Sceando, pronounced C-and-O. They also had a factory in Bredbury where they made the special glass required, and at Lowerhouse they assembled the bulbs. This company lasted only until 1923 when it was wound up in the face of anti-competitative action by the larger lamp makers claiming breach of patents. One of the driving forces of the company was Mr J. W. Pattison, who went on to found Radions Ltd., described above, and, later, Lustrolux, described below. J. W. Pattison joined with partners and set up another company, Lustrolux Limited, also in Lowerhouse Mill. This company not only made and repaired valves but also manufactured household lamps. Valve production at Lustrolux continued to about 1934/5 and domestic lamp production continued into the war years. 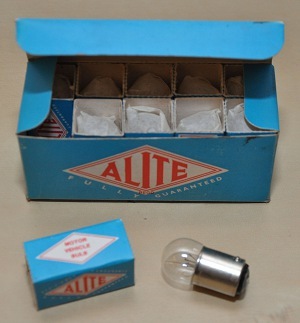 J. W. Pattison’s son, W. J. Pattison, began making vehicle lamp bulbs within the Lustrolux factory, principally for the commercial vehicle industry, and this became Associated Lighting using the trade name ‘Alite’ (picture left). This business was developed after WWII and by the early 1980s supplied 80% of the UK automotive industry demand for vehicle light bulbs, but no longer from Bollington. 1 Some of the information on this page comes from articles by Ian Macwhirter in the bulletins of the British Vintage Wireless Society , Vol.6 No.3. December 1981 and Vol.6 No.4. March 1982. 2 The full history researched and written by Ian Macwhirter – document. 3 ‘Grandad’ very kindly provided the description of the valve. I am most grateful to Ian Macwhirter for giving permission to publish his excellent history. I am also most grateful to Tim Matthews and ‘Grandad‘ for providing the picture of the valve and the facsimile of the US Patent.